This directory is a joint project of the U.S. Federation of Worker Cooperatives and the Democracy at Work Institute. 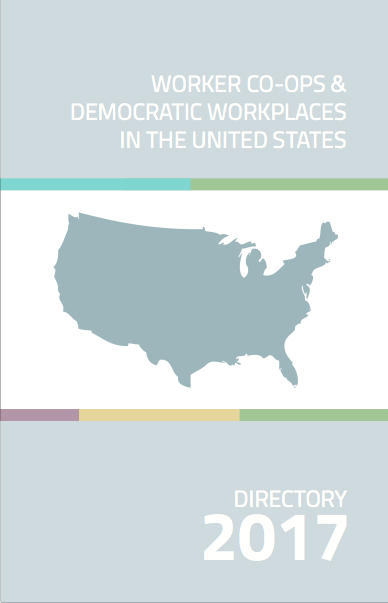 This updated Worker Co-op and Democratic Workplaces Directory (2017 Edition) offers a compilation of the fast-growing community of worker coops, other democratic workplaces, and support organizations—groups who together are advancing worker ownership across the United States. Corrections: While carefully curated, we are aware this content may have unintended omissions or errors. Please kindly submit any corrections or requests for inclusion for the next printed edition to directory@usworker.coop. Corrections and approved addition requests will be updated in the online directories. Here is the downloadable version of the directory.